Definition at line 305 of file llerror.cpp. Definition at line 303 of file llerror.cpp. Definition at line 304 of file llerror.cpp. Definition at line 803 of file llerror.cpp. Definition at line 184 of file llerror.cpp. Referenced by LLError::Log::flush(), and LLError::Log::shouldLog(). Definition at line 496 of file llerror.cpp. References LLError::addRecorder(), LLError::crashAndLoop(), e, LLError::LEVEL_INFO, LLError::Settings::reset(), LLError::setDefaultLevel(), LLError::setFatalFunction(), LLError::setTimeFunction(), shouldLogToStderr(), stderrLogWantsTime(), and LLError::utcTime(). 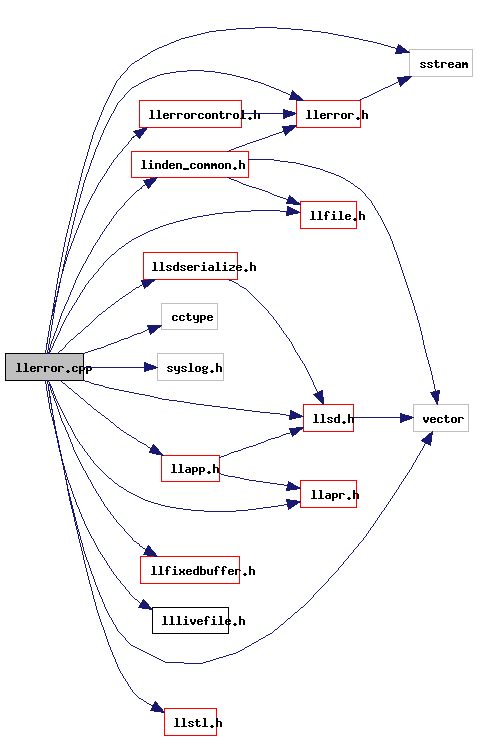 Referenced by LLError::initForApplication(), and LLError::initForServer(). Definition at line 590 of file llerror.cpp. References i, LLError::LEVEL_ALL, LLError::LEVEL_DEBUG, LLError::LEVEL_ERROR, LLError::LEVEL_INFO, LLError::LEVEL_NONE, LLError::LEVEL_WARN, llendl, and llwarns. Definition at line 224 of file llerror.cpp. Definition at line 615 of file llerror.cpp. References end, i, and list. Definition at line 470 of file llerror.cpp. Definition at line 486 of file llerror.cpp. Definition at line 744 of file llerror.cpp. References LLError::Settings::get(), i, NULL, r, and s.
Definition at line 320 of file llerror.cpp. Definition at line 162 of file llerror.cpp. Definition at line 310 of file llerror.cpp. Definition at line 311 of file llerror.cpp. Definition at line 129 of file llerror.cpp. Definition at line 95 of file llerror.cpp. Definition at line 823 of file llerror.cpp. Definition at line 824 of file llerror.cpp. Definition at line 147 of file llerror.cpp.